If any of you follow River City Fitness, you may have seen yesterday that I have decided to go back to one blog only. I don’t know why I thought I could keep up with two separate blogs when I have enough trouble keeping up with one sometimes! I have no plans to delete RCF but everything from there has been moved over here so there’s really no need to visit that page anymore. What held me up from making this decision for a long time was the fear that I’d lose my Race Recaps page, but it’s here too! Thanks for all the support, I hope to be back to regular blogging soon! In the meantime, you can ‘Like’ this blog on Facebook and follow me on Twitter if you are so inclined. 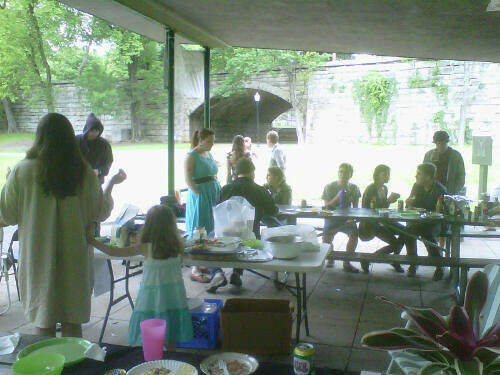 Saturday was Derby Day here in Kentucky but the Louisville Vegetarian Club decided to have an “alternative” cookout held at Tyler Park here in Louisville. This event was sponsored by Tofurky and Rainbow Blossom (a local health food store) who both donated food items! And the food was yummy too! And of course, the rest of the crew brought some really delicious food to share! I also had some spicy pasta salad a la Karen and these insanely addictive peanut butter chocolate chip blondies. Let’s just say I did not need to eat the rest of the evening! 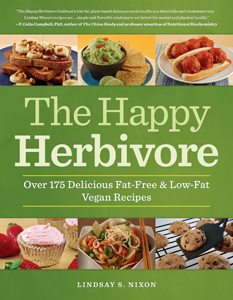 The Happy Herbivore cookbook giveaway! I really enjoyed being a part of the Happy Herbivore “blog book tour” and being able to have Lindsay answer some questions for me and my blog readers. You can read the interview here if you missed it! 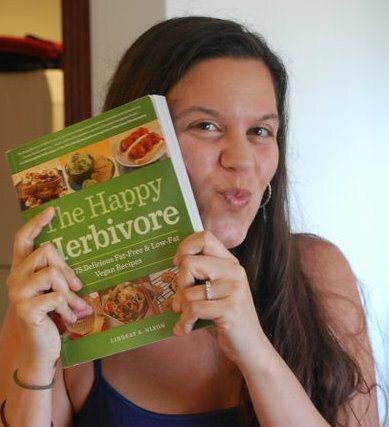 Now, I am really excited to announce that one of you can win a free copy of The Happy Herbivore cookbook for yourself! This contest will run until 11:59 p.m. on Monday, April 4th and to enter all you have to do is leave a comment on this post! Note: Open to U.S. and Canadian residents only per request of the publisher. I will choose a winner randomly and announce it on Tuesday morning! The Happy Herbivore stops by! 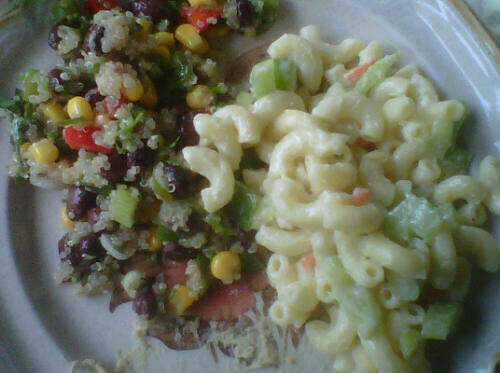 If you have not heard of the Happy Herbivore or her awesome recipes yet, you are truly missing out. To get you all properly introduced, she has offered to answer some questions for me and shares one of her recipes with you too! 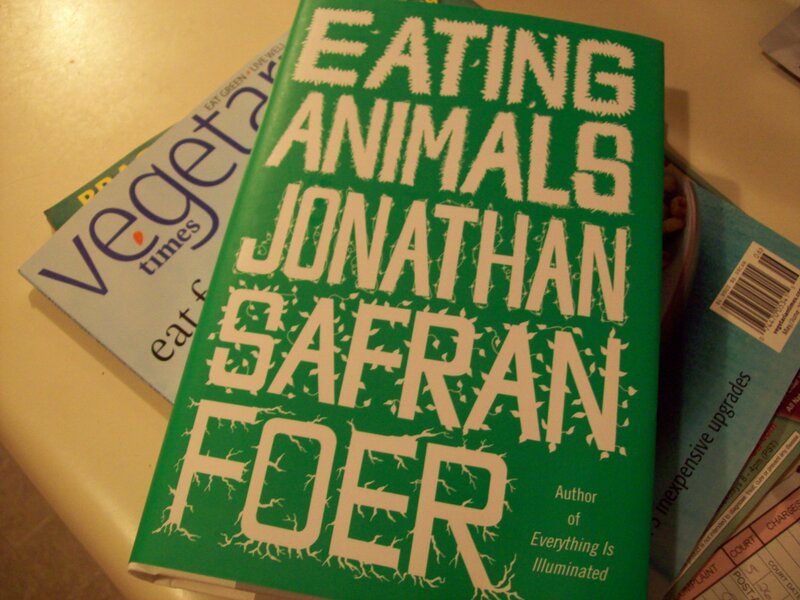 See Sarah Eat: How did you become vegan? 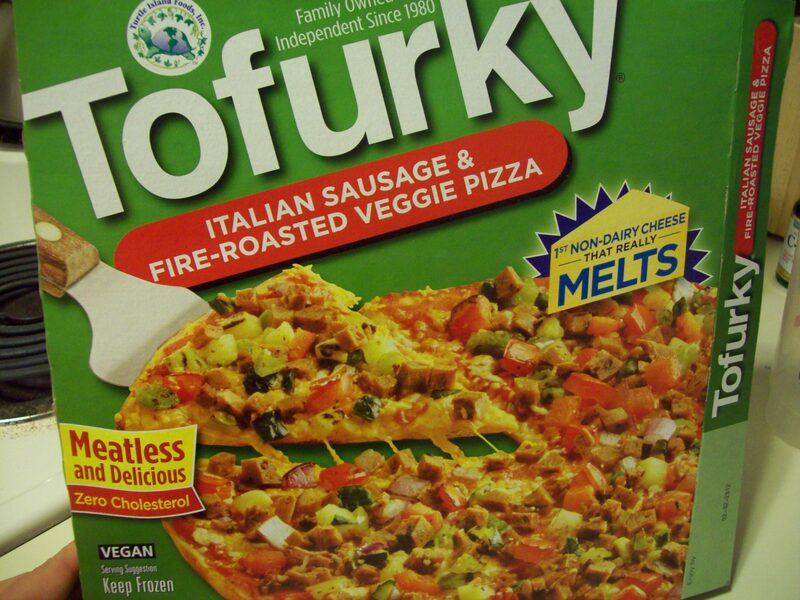 industries, I knew I’d be vegan for life. SSE: Amen to that! 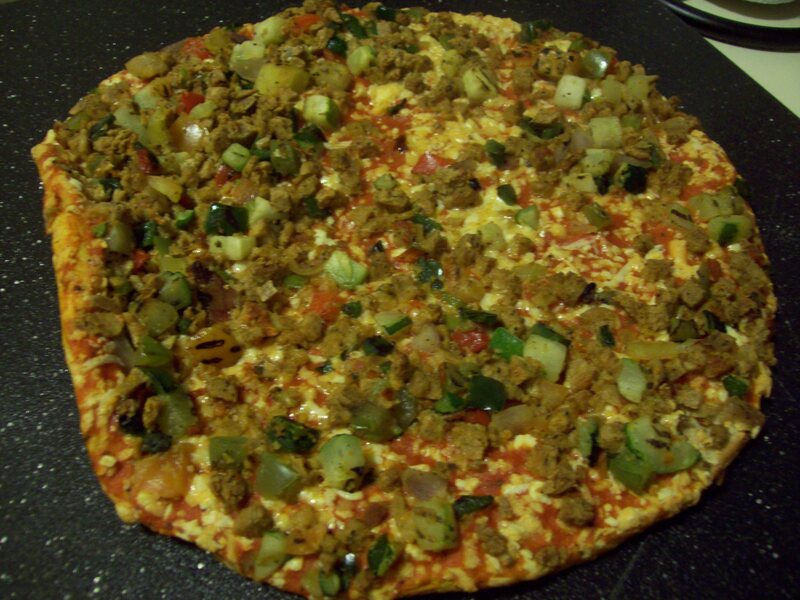 So, what do you think are some of the biggest challenges to eating a vegan diet? used to eat out a lot and my wallet and waste line suffered for it. Being vegan really does help me stay on track and make good choices. SSE: What inspired you to write your own cookbook? SSE: What is your favorite recipe that you have created? SSE: What new recipes/projects are you working on now? have a lot of aspirations! 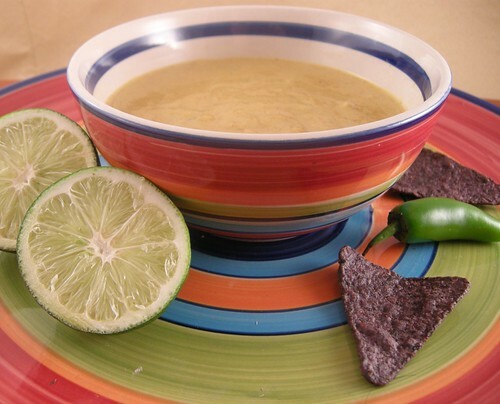 Lindsay is generously allowing me to share one of her recipes with you guys, which I hope you will all go home and make right now. Seriously, this stuff sounds delicious! This past Saturday, we had our monthly community meeting for the Louisville Vegetarian Club at a local joint, Cumberland Brews. 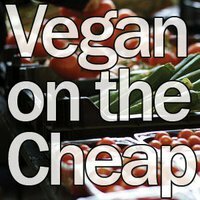 We had a really great discussion about how to eat “vegan on the cheap” and also how to apply that to other things we consume besides what we eat (clothing, beauty products, cars, etc). I learned a lot and it was great to hear where other people are coming from. Refreshing. We also got to eat some really tasty food! 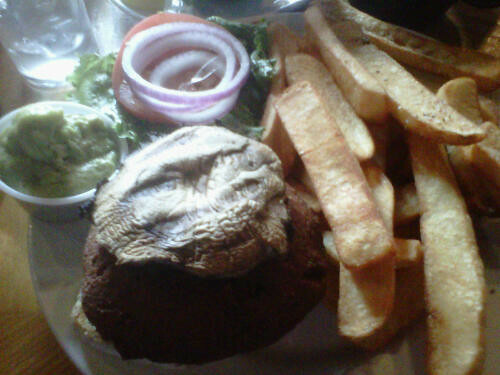 On the recommendation of my friend Karen, I ordered the veggie burger (which is a falafel patty!) with no cheese and some fries. The lighting was not the best but here’s a small glimpse. It came on a bun with lettuce, tomato, red onion and a mushroom, plus some guacamole I happily smothered on top. Would you believe I ate everything on that plate. 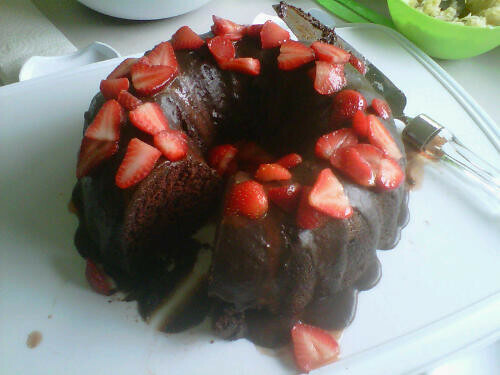 It got messy, but it was so good. Once again, I am very thankful for the LVC. If it weren’t for our meeting here, I would maybe never have known how delicious the food is (I’m not much of a beer drinker). I will definitely be going back again someday! 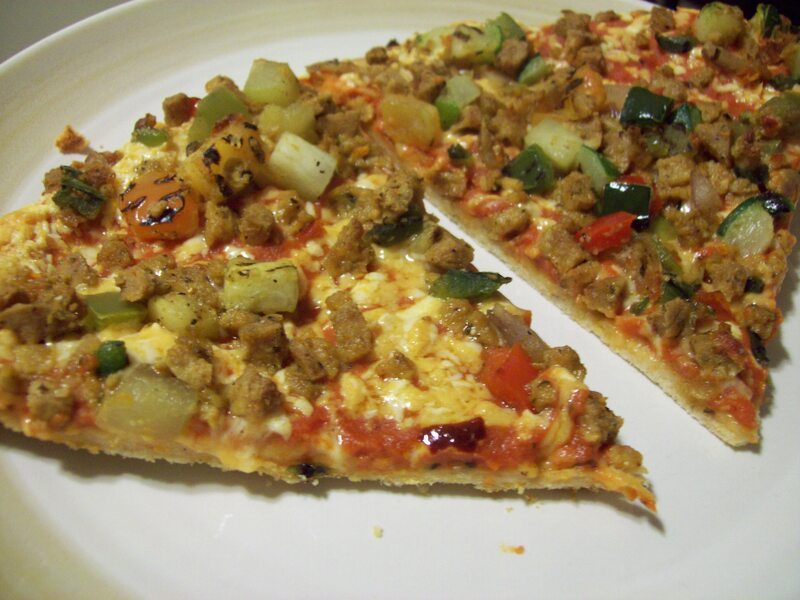 Louisville Vegetarian Club meets again! 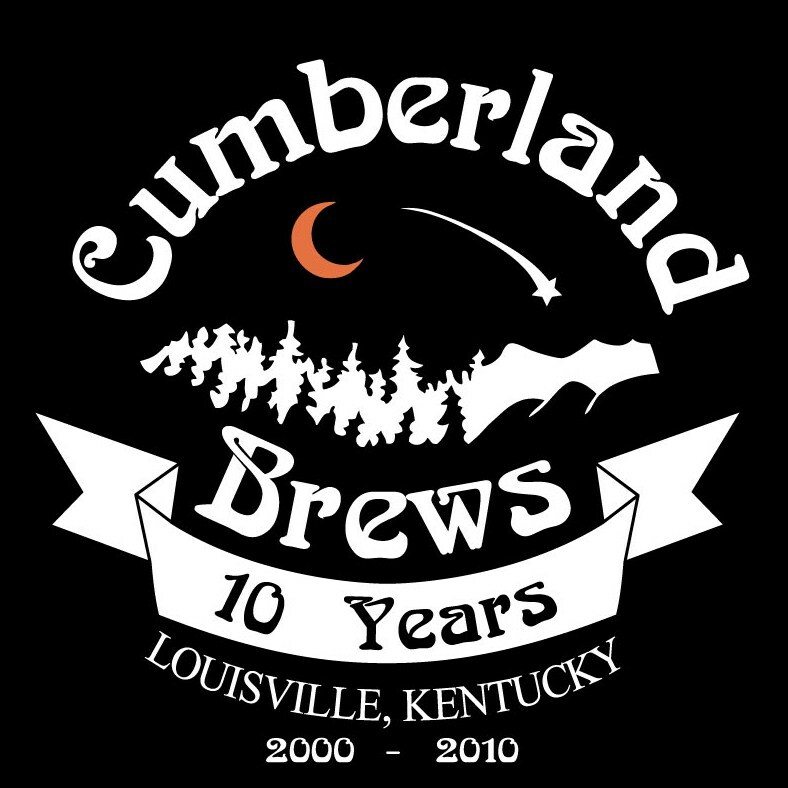 I can’t believe it’s already been a month since I last posted a meeting announcement, but this coming Saturday, February 26th, the Louisville Vegetarian Club will be meeting at Cumberland Brews starting at 1:00 p.m. Check out the invite on Facebook and RSVP if you wish to attend! 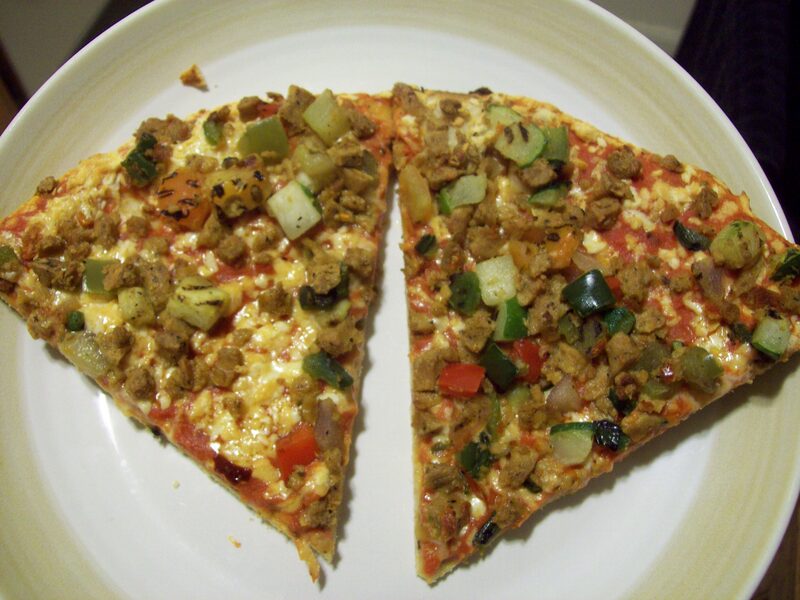 This month’s discussion will be led by Andrew, who has a food blog of his own, Jolly Green’s Kitchen 🙂 The topic is “Vegan on the Cheap” and I’m really looking forward to learning some new ways to save money while eating a vegan diet. So many people assume that healthy, vegetarian or vegan means expensive. Sometimes that is true, especially if you rely on a lot of processed foods. But there are ways around it and the benefits of a healthy diet will save you money in the long run. If you are in the Louisville area and you are currently vegetarian, vegan or an omnivore interested in the vegan diet, come on out and join us! For those of you in the Louisville-Southern Indiana area, just a heads up that the Louisville Vegetarian Club is going to hold our first meeting of 2011 this coming Saturday, January 29th at 1:00 at the Zen Tea House on Frankfort Avenue. 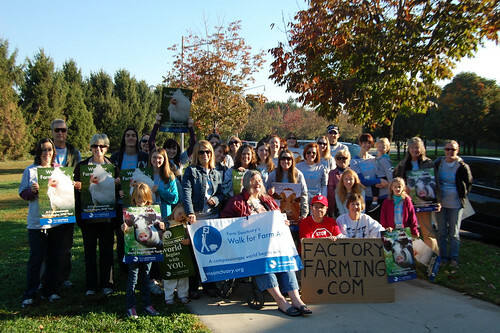 This club formed just about a year ago and we have already done so many things together including potlucks, dinners out, bakes sales, a holiday cookie exchange and the Walk For Farm Animals! On a personal note, I became a vegan in October 2009 for health reasons but through joining this group, I have learned a lot about animal abuse issues, the environmental impact of the human diet and enjoyed even more health-related discussions. I have also received a ton of support from like-minded people which has been such a blessing. Oh yeah, and I’ve also eaten more delicious food this past year than I can ever remember! Check out the event on Facebook and RSVP if you are interested in joining us! I had been to Austin’s Restaurant here in Louisville maybe three times in my entire life. I couldn’t remember much about it, other than I liked the spaciousness of the inside and that they held a lot of banquets/parties there. So when my mom wanted to go there for her birthday celebration with our family, I decided to check out the menu. So I emailed the address listed on their website to ask about vegan options. I got almost an immediate response from the general manager, Adam, who informed me that most items on their menu do indeed contain meat and/or dairy, but that the kitchen staff would be more than happy to make a special dish for me. I was really excited by this response, not just the timeliness, but the fact that he was willing to work with me. I’ve emailed places before and either gotten no response, a generic response indicating they did not even read my email, or in the case of Applebee’s, my email was answered by a phone call from a person who did not speak very good English. Last Sunday when we went to Austin’s, I was the last to order and I was a little nervous. It’s intimidating when you are with 8 other people and you are the only one with a special request. I was also a little unsure of what I wanted and had hoped the waitress would recommend something or ask the chef/kitchen staff what they usually make if they receive a request such as this. She told me if I knew what I wanted, they’d make it, but they couldn’t just pick something for me. Duh, it was silly of me to think that, right? 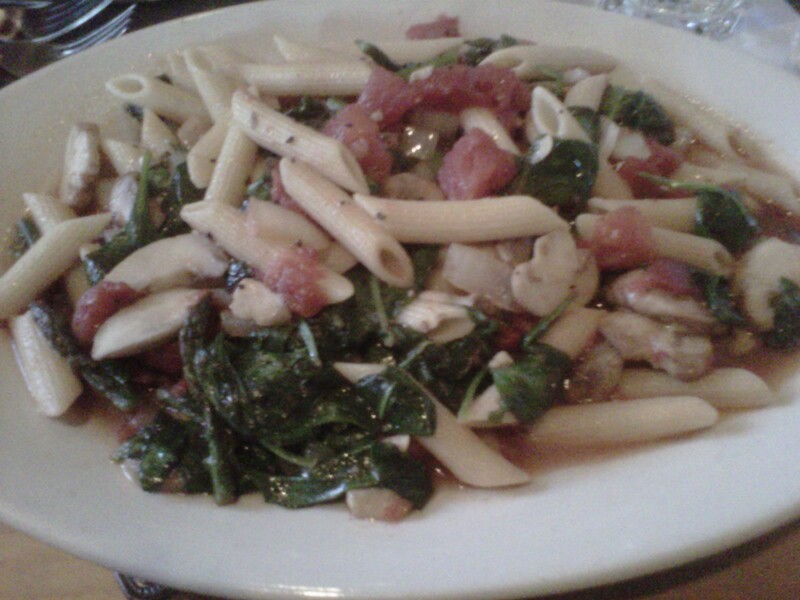 Luckily, she sent the kitchen manager out who suggested their spinach pasta dish, minus the chicken and cheese, and with a ton of veggies added in their place. Sounds good to me! This dish was delicious! The mushrooms were probably my favorite part, but all the veggies were just so fresh and went very well with the olive oil-garlic sauce. They even threw some asparagus in there. It was also great because I had enough for lunch that day plus leftovers! While I was a little worried at first, I ended up being very happy with my dining experience and even my family was impressed that a restaurant would go out of their way for someone with special dietary needs. A lot of times, I am afraid to ask so I will just order a salad or a plain baked potato. But I’m glad I stepped out of my comfort zone this time. 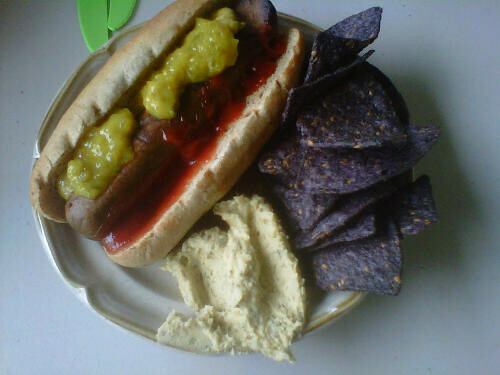 If this is how I plan to eat forever, then I’d better get used to it! Have you ever made a special request at a restaurant? How did it go?